You will need Node 6+ installed on your machine. Some prior experience with Angular will be helpful. 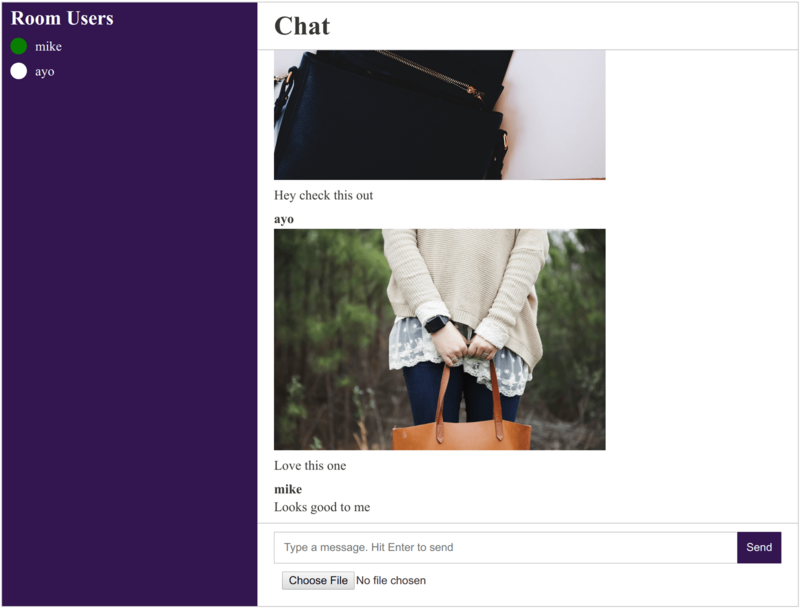 This tutorial is a continuation of the How to build a chatroom with Angular 7 and Chatkit one, so you need to complete that first before moving on to this one. You can clone this GitHub repository and follow the instructions in the README file to get set up. For the most part, aside from being able to send text messages, users also expect to be able to share images, documents and other files in a chat session. Typing indicators are also commonplace in most mainstream chat applications, and users might expect yours to have that too. Chatkit makes it really easy to incorporate these two features as you’ll see. Typing indicators are a staple amongst all the most common chat applications out there, but they can be difficult to build on your own. Adding support for typing indicators with Chatkit is effortless in comparison. When a user is typing, we call the sendTypingEvent() method which invokes currentUser.userIsTyping. Then we listen for the userStartedTyping and userStoppedTyping events which allows us to update the usersWhoAreTyping array and show a message in the chatroom indicating which users are typing. We can easily configure our chat app to support attachments with Chatkit. In this case, I’ll show you how to add image attachments to this application in a few simple steps. We’ve added a new file input tag that allows us to pick a JPEG or PNG image from the file system, and a send button to submit the form. Also notice the new img tag that has been added to conditionally render an image if one is present in the message. Here, we are leveraging Angular’s ViewChild decorator. ViewChild allows us to query our view to get an element or directive of our choice. In this case, we want a ViewChild for our message form. In the AppComponent class, we’ve set a ViewChild property to our form’s template variable (@ViewChild('form') form)so that we can call this.form.nativeElement.reset() once the Send button is clicked which has the effect of resetting the text and file inputs. To send an attachment, we only need to grab the file and append it to the message object via the attachment property. The name property will be used as the name of the file that is stored by the Chatkit servers. If you pasted the code above into your editor, remember to change <your room id> and <your instance locator> as appropriate. At this point, you should be able to send image attachments seamlessly. Note that attachments must be accompanied by a message at this time. In this tutorial, we explored two additional features supported by Chatkit and added them to our application without writing a ton of code. Chatkit has a small but powerful API that manages all our chat data for us so that all we have to do is take that data and render it for the user. To look at the other features Chatkit it has to offer, feel free to visit its documentation page. Also, don't forget to grab the complete source code in this GitHub repository.